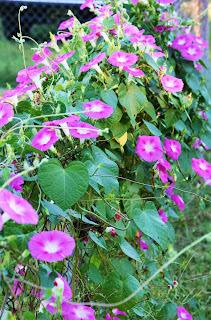 I just love walking outside in the mornings and being greeted by these happy morning glories!!! The Lord is SO sweet to give us such beautiful things to look at and be reminded of Him and His creation. Today is going to be a rather quiet day around our home. Just normal household chores to be done- Elizabeth's laundry, vacuum the house, clean the master bathroom. For lunch today (lunch is our main meal of the day), I am making my sister-in-law's Taco Soup. YUM! And I just may make Kelli's Maple Cookies. They look SO delicious!!! I look forward to days like this that aren't so busy. I get time to read more, make a few phone calls to friends I haven't spoken with in a while, and I will take time to read some of the deeper, more meatier blogs that I don't always get around to. So, what are you up to today? Is it a busy day in your household? As Mother Moments just postd on her blog, "Value simplicity in your lifestyle." Glad you had a day full of peace! 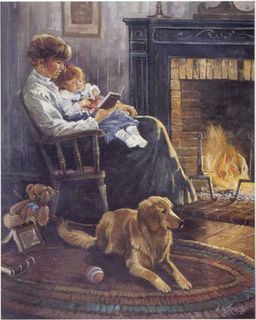 I hope you have a wonderfully cozy, quiet day, Mrs. U! I made some more of the maple cookies this past weekend. I had saved some of the dough in the freezer and it thawed perfectly! Where do you live that they look that beautiful? My faded awhile ago here in MN. I had to go grocery shopping today but it was still a nice day. Just puttering around the house. My hubby is home taking some family leave time so that I really rest and get this foot healing - a wonderful help especially since my mum went back home after two weeks of being so very helpful. He has taken over homeschooling and all the driving. Just a quiet day here too, thankfully! Quiet days are wonderful, but few around here. Normally, there is so much outside work to be done that I feel guilty if I'm not going at full speed to get it finished before winter arrives. Your morning glories are beautiful!! Barbaralee, I'm here in "the South". I wasn't quite sure the morning glories were even going to bloom this year!! They got a very late start. But I sure am loving them now! Whew!!! Life's been busy lately!! Do you wear cleaning gloves?